A spacious, private studio style suite with your own private entrance and large deck. 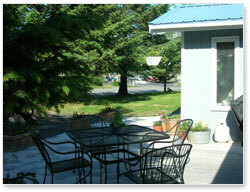 This second story unit can sleep up to four persons in two comfortable quilt covered queen size beds. A queen size sofa sleeper is also available for children, allowing the room to accommodate up to six people. Two recliners along with the overstuffed couch provide plenty of seating to relax and enjoy your room. Also included in your room is a granite top dinette table and chairs to take in breakfast or a game of “Sewardopoly”. This unit has the best of views with many large windows to enjoy the scenery. The rate for Den 1 & 2 is $195 plus taxes for 2 people. $20 per additional guests. Off season rates available Sept 15 to May 14th. A very nice ground level unit with a large patio area in front. 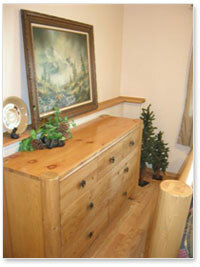 This spacious one bedroom suite includes a separate master bedroom with a queen log style bed & dresser . In the main area is a queen size sofa sleeper and two leather recliners. A granite toped dinette table and chairs is perfect to enjoy breakfast or visit over coffee. This unit is especially nice for guests who may have trouble with our “Midnight Sun”, as it is a bit dimmer due to less windows than the upper unit. Den One and Two each have a mini-kitchenette with a small frig, microwave, toaster and coffee pot. Your room is stocked with a hearty continental style breakfast to eat at your leisure. Breakfast includes an array of pastries, breads and cereals, fruits, yogurts, juice and milk, as well as a complimentary selection of fine teas and fresh ground coffee. Each den also has a color television with cable and remote control, VCR & DVD with a selection of complimentary movies. A private ¾ bath, stocked with plenty of towels, soaps and lotion, is located within these dens. A large ground floor unit with a walk up patio and French door entrance. This den is perfect for families, larger groups or extended stay visitors. It features two bedrooms, both with a queen pillow top beds. A small den with a full size futon is also available, allowing the room to sleep up to six comfortably. The common room has a comfortable setting area with an overstuffed leather couch and chair set, a color tv/dvd/vcr and a selection of movies. The full bath is stocked with plenty of towels and complimentary soaps and lotions. Although breakfast is not provided in this unit, it does have a full kitchen with a toaster, coffee pot, microwave and an apartment size stove and refrigerator. The kitchen is stocked with cooking utensils, dishes, pots and pans for your use, as well as complimentary teas and coffees. A gas grill and patio table and chairs are located outside on the patio. Two grocery stores are close by, allowing guests to stock up on all their favorite foods, drinks and munchies. The rate for Den 3 is $215 plus $20 each additional person, with a minimum 2 day reservation. 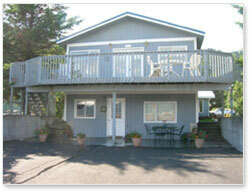 Off season rates available Sept 15 to May 14th. Check in between 5:00 and 7:00 pm. Special arrangements are often possible for early check in or late check out. We will do what we can to accommodate special requests. Children are more then welcomed and we offer a small portable crib for infants. Sorry, we are not able to meet special dietary requests. 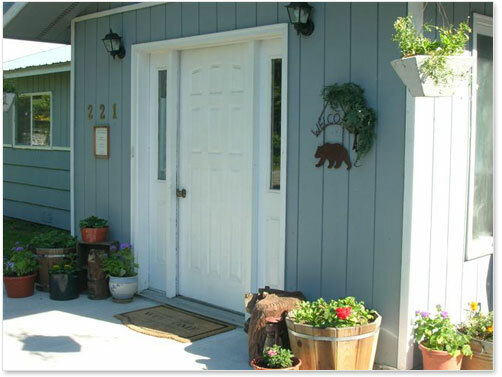 Bear's Den Bed and Breakfast is smoke free, however, smoking is allowed outside of the rooms. One night deposit is required to secure reservation. VISA, MasterCard, personal checks and cash accepted. If it is necessary to cancel your visit, please advise us within 30 days for reservations of 3 or fewer days; 60 days for reservations of 4 to 6 days; or 90 days for reservations of 7 or more days. Full amount will be charged for cancellations of less than required notice unless we are able to rebook the room. 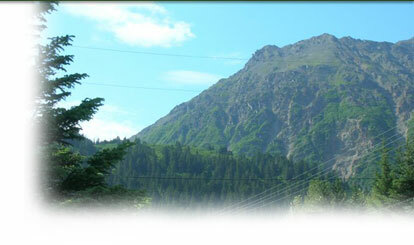 Our family looks forward to meeting you and making your visit to Seward a comfortable and memorable experience. Online reservations not available. Please call or email for additional information or to make a reservation.